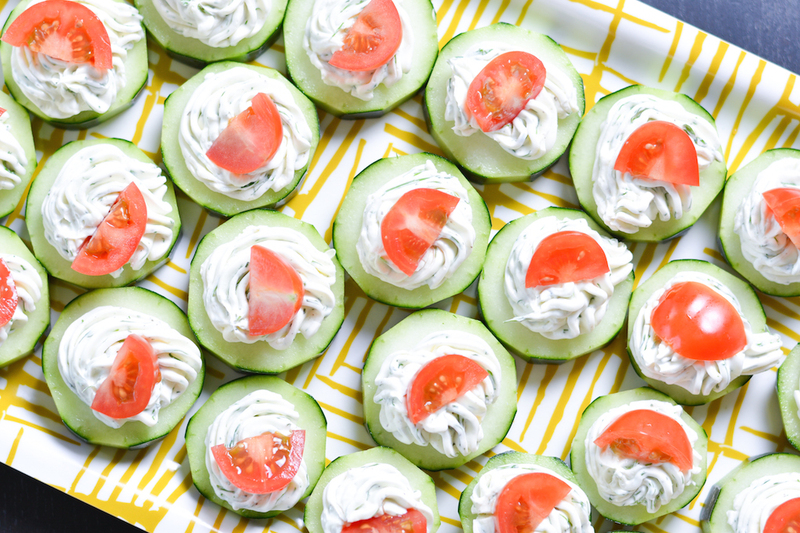 These fresh Dilly Cucumber Bites make a great healthy appetizer. Cucumber slices are topped with a fresh dill cream cheese and yogurt mixture, and finished with a juicy cherry tomato. Parties and get-togethers are a great excuse to make some of my favorite more indulgent treats, like brownies and cookies and cheesy dips. But this past month I had so many occasions to make snacks that I actually got a little sick of eating junk. Can you believe it? So I wanted to make a healthy, but still delicious, appetizer to take to a recent potluck. Though I haven’t had many weird cravings during this pregnancy, I have been pretty thirsty since the very beginning. My thirst has me reaching for juicy foods like watermelon, oranges and cucumbers. Sometimes I’ll just eat a cucumber as if it were a banana. Can’t get enough of those suckers. Anywho, we have a ton of fresh dill growing in the garden right now and it’s one of my all time favorite herbs. Last year it bolted as soon as it got hot out, so I’m trying to take advantage while it’s still cool and use all the dill I can. Dill and cucumber go together like PB&J (hello, dill pickles), so I thought a dilly cream cheese or yogurt would be perfect for topping some cukes. I ended up using a little of each, plus some ranch dressing mix for extra flavor. These little bites were so tasty and I didn’t feel too bad eating a million of them since they are mostly veggies! They were the perfect healthy snack and everyone loved them. Make sure that you use the powdered Ranch dressing mix in a packet– not an actual bottle of Ranch dressing, otherwise your topping will come out way too wet. If you don’t have grape tomatoes, you can quarter cherry tomatoes, or even cut large tomatoes into bite-sized pieces. It’s easiest to make the topping with an electric or stand mixer, but if you don’t have one, don’t fear! Just make sure the cream cheese is extra soft at room temperature, and mix it the old fashioned way with a spoon and a little elbow grease. And if you don’t have a piping bag, you can use the old Ziplock bag trick. Just put the topping mixture in a gallon sized Ziplock and snip a small corner off the bottom of the bag. They won’t be as cutesy without the star tip on a piping bag, but they’ll be every bit as delicious! Transfer the cheese mixture to a piping bag (if you don't have one, you can use a large Ziplock bag with a corner snipped off). Pipe the cheese mixture onto the cucumber rounds, then top with a cherry tomato half! If you love this recipe, you might also like to check out these bite-sized apps! I LOVE fresh dill, and these look so fresh and delicious, Jess! They’re so pretty and the perfect little bites for spring! Thanks, Marcie! Fresh dill is definitely one of my favorite herbs to use! I love cats versus cucumbers. But my cats don’t really get it either. 🙂 Dill and cucumber is such a great combination. These look awesome. LOL! Isn’t it SO funny?? I wonder why they are so scared of them! Thanks, Amanda! So I have to admit that I don’t like cucumbers, BUT my cucumber-loving husband would adore these! 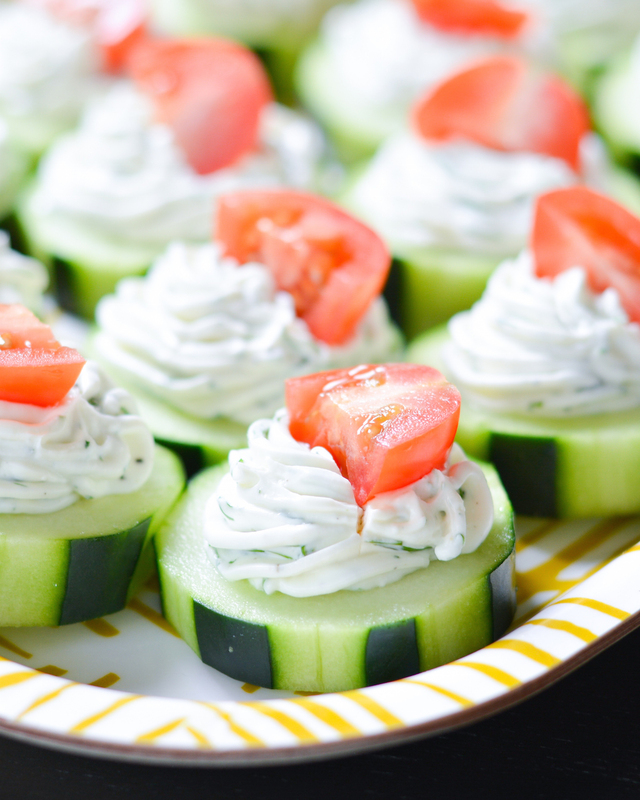 And these do look so cute too…what a perfect party appetizer! That’s so funny Gayle… I know a few people who hate cukes but I never quite got it because to me they have such a mild flavor. But then again, I don’t meet many foods I don’t like! I love these! Cute and healthy! And cream cheese + cucumbers is my fave! Thanks, Denise! They were such a yummy healthy snack! Haha, I’ve seen that cat vs cucumber video. So funny! I loved watery foods too. I went nuts on watermelon. Was extra good in the summer when it was swelteringly hot. I love this dilly cucumber bites! Makes me excited for spring! i’m have a party for 25 people. Can you tell me how many pieces does the cucumber bites recipe make? I would like to know the same thing. How many pieces does this recipe make? How well do these freeze? Prepared, ready to defrost and just serve? I could wait to top them with cherry tomatoes. I am having a party for 100 people. Can you estimate amount of ingredients needed? Hi Gayle, I would not recommend freezing cucumbers. They would probably defrost slimy and watery. Cucumbers freeze very poorly. Don’t do it. You’ll have a shriveled watery mess. Can’t wait to try these! Look healthy and delish! Hosting a Babyshower, these would be perfect, how in advance can these be made. Night before? Morning of party, or 1 hour before? You can make the cream cheese/yogurt part the night before but I would wait til day-of to cut the cukes and assemble. If you make them more than an hour before, I’d store them in the fridge! has??? Or what is similary to a german Dressing??? Can u so this the night before? Will it’s stay piped looking? Hi Jou– You can definitely make the cream cheese mixture the night before. I would probably wait until the day of to cut the cucumbers and pipe the mixture on. How far in advance can these be made. I’m planning to make for my daughter’s wedding? Hi Linda– You can definitely make the cream cheese mixture a day or two ahead of time, but I would wait to pipe it until day-of. I made these for a party on 9-17-2016, they were a big hit. The recipe was requested by many. I made the topping the night before and it was a perfect consistency. Thanks so much for the recipe I will make them many times more for sure. How much does this recipe serve comfortably? Rather than using tomato on top could do you think it would taste ok with an olive or maybe ham chunks? I know this is nearly a year later, but I can’t eat tomatoes due to them being a migraine trigger. I’ve subbed in thinly sliced radishes (they add a nice peppery taste) or sprigs of parsley. I wouldn’t add olives or ham; they’d be too salty. I’m sure you no longer need this answer, Drea, but If someone else needs it, perhaps this’ll help. Would it be just as tasty with dried dill? yup! I used 2 tbsp of dry dill when making them today – it was great! These were delish, but for some reason mine turned watery, not sure what I did wrong. I think if I made these again, I would allow the cucumbers to dry out some or pat them dry before apply the cheese mixture. Flavor was still great! Mine were super watery, too. I even patted them dry before piping the filling, because the filling didn’t want to stick to the cucumbers because they were so wet. That helped to get them all assembled, but then during the party, they were just wet on the plate. I wonder if putting a paper towel down on the serving plate would help. I wonder if you could substitute Sour Cream for yogurt? making them lower in Carbs!